Chloé diffusion line See by Chloé, which has never formally shown--in any format--will debut a fall 2012 collection tomorrow and you won&apos;t have to fly to Paris to see it. It will be the second commercial fashion brand to stage its inaugural runway show through PR powerhouse KCD&apos;s new Digital Fashion Shows platform. The platform launched during New York fashion week with Prabal Gurung&apos;s first collection for ICB, which made us early adopters of the super-convenient show format. Unlike a livestream, the show has been pre-recorded and while only editors and buyers have been invited to view the show, Chloé is giving fans the opportunity to watch the video just half an hour later. According to a release this show will see the debut of a new design direction for the line as well, described as a "stronger, more directional focus." It&apos;s an interesting decision for the brand. Diffusion lines are typically created simply as a commercial alternative to the main line to boost sales. We&apos;ve always seen the brand as an assortment of cute, wearable pieces rather than a full-on fashion collection and this could potentially change all that. It will be interesting to see what&apos;s next for See by Chloé--and if other diffusion lines will follow suit. An early look at the collection can be seen above. What do you think? Besides offering a more affordable yet still chic alternative to Chloe's main line, See by Chloé is currently on the forefront of a couple of trends this fashion month: online fashion shows and Paris' increasing acceptance of designers' second lines. (Suzy Menkes wrote in today's International Herald Tribune, about a new "parallel fashion universe" being created with secondary lines offering more accessible French fashion.) 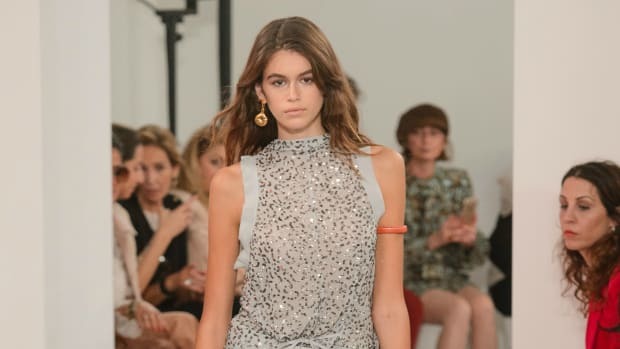 See by Chloé, which launched 10 years ago while Stella McCartney was still designing the main line, is now in the midst of a bit of a revamp, hence this online runway show--a deviation for the brand, who have previously never formally shown. The jacket, by Israeli designer Danit Peleg, is completely made-to-meaure and zero-waste, but it's not cheap. Chloe Sevigny (the actress) tells us why she loves Chloe (the brand)--but stopped loving her own first name.